History: Adolescent Male with knee pain. 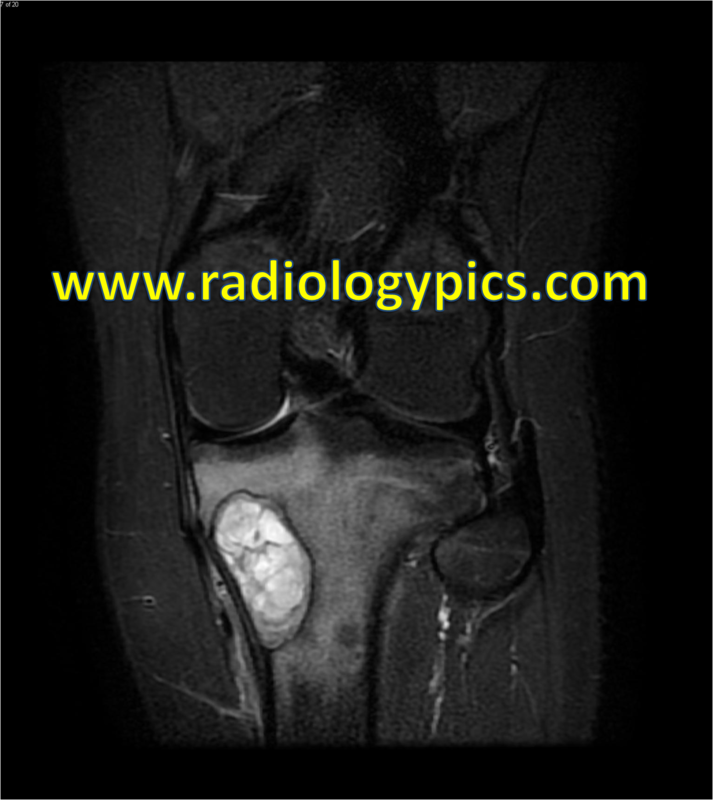 Solitary or Unicameral Bone Cyst: Coronal CT of the left knee without contrast reveals a lytic lesion in the medial left tibial metaphysis with a narrow zone of transition. The adjacent cortex of the tibia is thinned, but intact. This is characteristic of a solitary bone cyst. Solitary (Unicameral) Bone Cyst: Coronal T1 weighted MRI reveals the lesion to be hypointense with surrounding hypointesne signal in the adjacent marrow, indicative of marrow edema which is frequently seen with solitary bone cysts. 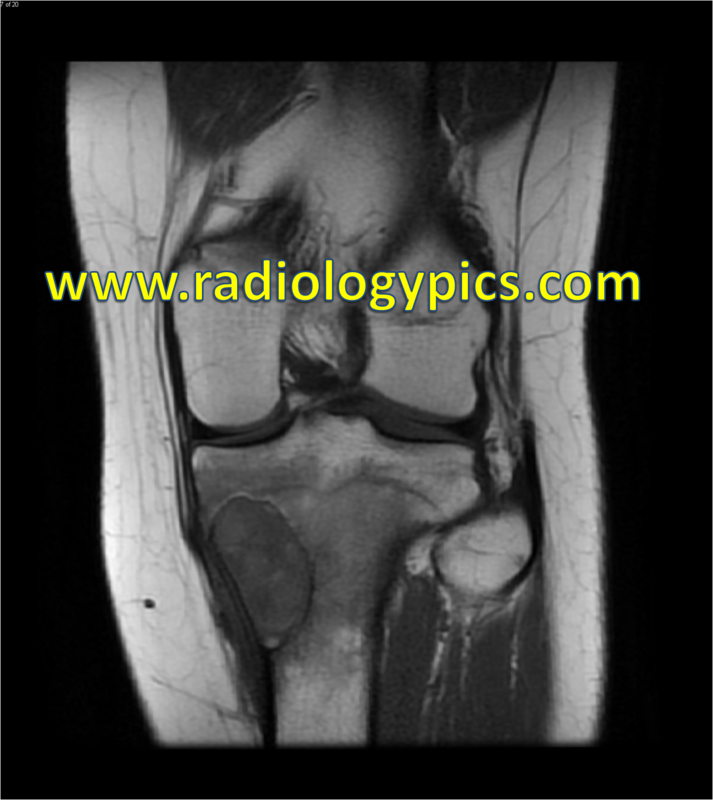 Solitary (Unicameral) Bone Cyst: Coronal STIR MR of the left knee reveals the lesion to be markedly hyperintense with internal septations. There is increased signal in the adjacent marrow, indicating marrow edema, possibly from pathologic fracture which may be seen with solitary bone cysts. This is a case of a solitary or unicameral bone cyst. A solitary bone cyst (also called a juvenile bone cyst, unicameral bone cyst, essential bone cyst, or simple bone cyst) is a benign lytic bone lesion that is fluid filled. 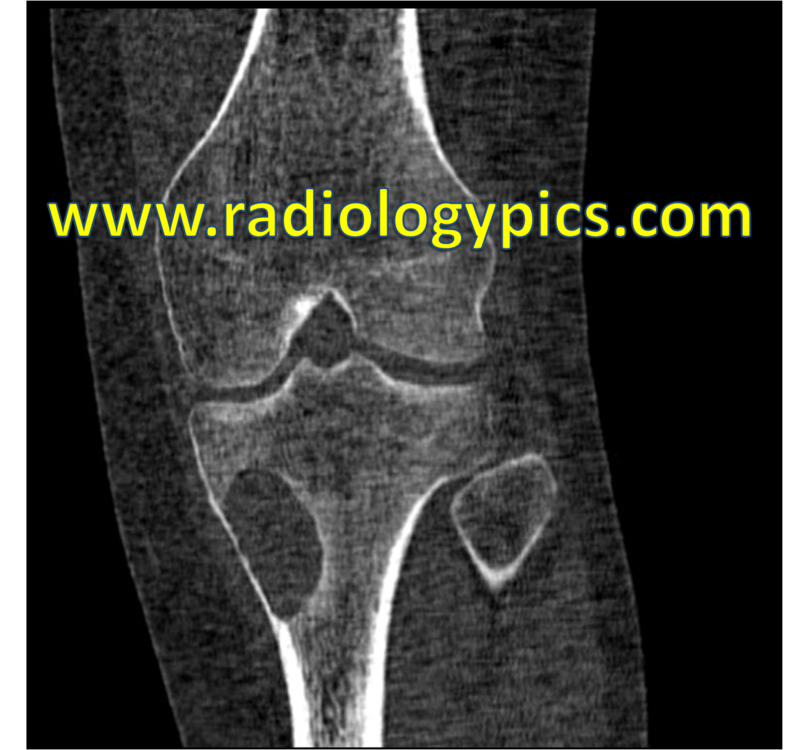 The most common location that solitary bone cysts occur in is the calcaneus in adults and the proximal humerus in children. They arise in the metaphysis close to the physis, as seen in the images above. On MRI T1 weighted imaging, unicameral bone cysts are homogeneous low to intermediate signal, and on fluid-sensitive sequences they show high signal (image 2 above). High signal in the marrow indicates marrow edema. Some have used the mnemonic FOG MACHINES or FEGNOMASHIC for lytic bone lesions, which can be further broken down by age group and other various features such as absence of pain. You can read about it here.